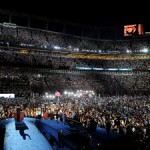 Continuing a tradition of Harman Professional sound technologies being employed at the conventions of both major U.S. political parties, the company today announced that its JBL Professional VERTEC® line array loudspeakers were deployed by leading rental sound system provider, ATK Audiotek, at the Democratic National Convention at Denver’s Pepsi Center. 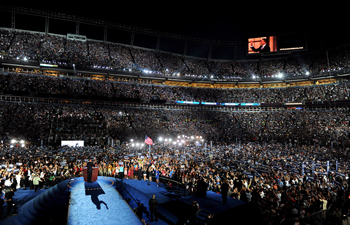 A JBL VERTEC system was also used for presidential candidate Barack Obama’s acceptance speech at the city’s Invesco Field football stadium, with Crown power amplifiers also in use at both facilities. The combination of JBL speakers and Crown amplifiers has also served as the sound system of choice for many of the party’s recent election rallies and assemblies around the nation. The Pepsi Center in downtown Denver opened its doors to Democrat convention-goers on August 25 and hosted key speeches by Senator Ted Kennedy, Michelle Obama, Senator Hillary Clinton, former President Bill Clinton and other party stalwarts including Vice Presidential candidate, Senator Joe Biden. The convention concluded on August 28 with an acceptance speech by Senator Obama at Denver’s Invesco Field and featured live performances by Steve Wonder, Jennifer Hudson, Will.i.am accompanied by John Legend, and the Agape Choir, Sheryl Crow and Michael McDonald. The stadium swelled to an 85,000-person capacity with much of the infield used for temporary seating. Event Sound Designer and Chief Engineer Pat Baltzell of Baltzell Audio Design specified 82 JBL VERTEC VT4889 large-format line array loudspeakers, eight VT4880A arrayable subwoofers and 68 VT4887 compact line array loudspeakers set up in distributed fill arrays for the Pepsi Center sound system. ATK Audiotek deployed 22 channels of bi-amped amplification with Crown Micro-Tech 1200 on the high frequency drivers Macro-Tech 3600 for low frequency drivers. The portable system for Invesco Field comprised 76 JBL VERTEC VT4889 full-size line array elements and 12 JBL VT4880A arrayable subwoofers in sports-venue perimeter configuration along with 32 JBL VT4888 midsize line array elements for delay-tower applications powered by three racks of Crown I-Tech IT8000 amplifiers. All monitors for the Invesco Field performances were powered by 20 channels of Crown Micro-Tech 1200 and Macro-Tech 3600. An additional battery of Crown I-Tech IT4000 amplifiers powered JBL Professional VRX928 compact line array elements for fill applications throughout the stadium. According to Mike Stahl, President of ATK Audiotek, the system performance, ease of integration and proven reliability make Harman Professional components the go-to solution in such high-profile applications.